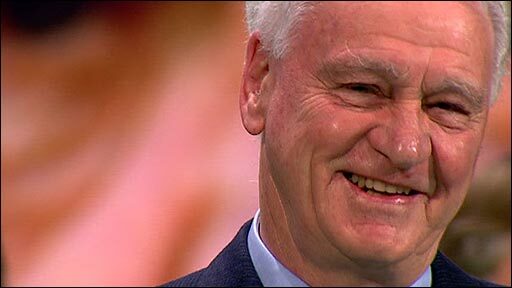 When Sir Bobby Robson took over as manager of Newcastle United in September 1999, he described the appointment as "going home". Born in County Durham on 18 February 1933, the son of a miner returned to the north-east more than 50 years after his father Philip and brother Ron used to join him on the terraces at St James' Park every other Saturday. It was to be the former England coach's last major role in football. Robson was sacked by the Magpies in August 2004 and, despite a short spell as a consultant to the Republic of Ireland team, at the time of his death at the age of 76, his remaining links to football were as honorary president at the club where he made his name as a manager, Ipswich Town, and as an ambassador for the Football Association of Ireland. Known for the battling qualities he instilled in his teams, Robson also fought cancer five times. In December 2007, he received the lifetime achievement award at the BBC's Sports Personality of the Year show, presented by his friend, the Manchester United manager Sir Alex Ferguson. Robson's rise to fame began as a wing-half with Fulham in the 1950s, he then switched to West Bromwich Albion - where he played 257 games and scored 61 goals - before returning to Craven Cottage in 1962. He also won 20 England caps. After a brief spell as a player-coach with Vancouver Royals in the North American Soccer League, he took over as boss of Fulham in January 1968 but was sacked by Christmas. He arrived at unfashionable Ipswich in 1969 and during his 13 years at the helm, he won the FA Cup in 1978, Uefa Cup in 1981, and twice led the Portman Road outfit to the runners-up spot in the old First Division. 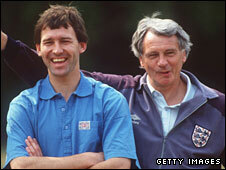 Robson also garnered a reputation for building and utilising a youth policy, playing the game in a way that delighted the purists - a slick, passing one on the ground - and for bargain buys, with Dutchmen Arnold Muhren and Frans Thijssen being but two examples. When Ipswich beat favourites St Etienne 4-1 in the Uefa Cup quarter-final, first leg in France in March 1981, they received a standing ovation from the stunned home fans - who had seen the likes of Michel Platini and Johnny Rep, for once, outclassed. And such performances did not go unnoticed at the Football Association. Ipswich's Cobbold family hierarchy had always insisted that they would only consider the departure of Robson if it was to take over as England boss - and the call to succeed Ron Greenwood came in 1982 after what pundits believed to be a straight race between the Town manager and legendary Nottingham Forest boss Brian Clough. Perhaps it was something in the Suffolk water because World Cup-winning England manager the late Sir Alf Ramsey took over his country after earning his managerial spurs at Ipswich. Both he and Robson had their efforts commemorated by the erection of statues at Portman Road and both were knighted for their services to football, Robson in 2002 after lengthy local newspaper campaigns in East Anglia and the north-east. England missed out on the 1984 European Championship but Robson then led them to the 1986 World Cup quarter-finals - where they were beaten by Diego Maradona's infamous 'Hand of God' moment, as well as a wonder goal from the Argentine legend. Robson's team failed to win any of their group games at the 1988 European Championship but they came good in the 1990 World Cup in Italy. England reached the semi-finals where they suffered an agonising penalty shoot-out defeat at the hands of West Germany. His England reign coincided with an upturn in media interest in the national role and such scrutiny led to some critical headlines during the low points of his career - a legacy that Graham Taylor, Sven-Goran Eriksson and Steve McClaren went on to inherit. Robson endured further pressure during Italia 90 because it was revealed during the tournament that he would be leaving the position to take over as coach of PSV Eindhoven. He won two titles in the Netherlands before joining Sporting Lisbon in 1992, where he was axed within 18 months after a Uefa Cup exit, despite being top of the Portuguese table, and then signed up with rivals Porto. He was known as Bobby Five O at Porto because his sweeper system ended the club's slump in form and they developed a habit of winning 5-0. His two title triumphs in 1995 and 1996 sparked the interest of Barcelona. Robson joined Barca as boss in July 1996 and led them to glory in the Copa del Rey and European Cup Winners' Cup, while nurturing the talents of Brazilian striker Ronaldo, who he signed for £12m from PSV Eindhoven. The former England manager's assistant was a certain Jose Mourinho. The ex-Chelsea and current Inter Milan boss was also Robson's translator at Sporting Lisbon. In 1997 Robson moved upstairs to become general manager at Barca before returning to PSV for a year from July 1998. Newcastle then beckoned in 1999 and he led the club from the bottom of the Premier League in that campaign to fourth place in 2001/02 and third the following season, which meant Champions League spots on both occasions. Robson had produced a similar change of fortunes when at Ipswich in 1979/80. Lying bottom of the old First Division in the October, Town ended the season in third place. Such feats ensured he will remain forever in the hearts of those who follow the Tractor Boys - and those who were not an actual fan of the club but just relished the style of football he brought to Portman Road. There were murmurings of discontent from Suffolk in 2003 when Newcastle's acquisition of Darren Ambrose on the back of other exits at cash-hit Ipswich seemed to suggest Robson was using his old club as easy pickings - but such feelings soon disappeared. As many fans arguably turned out to see their former manager return to Portman Road with Porto in the 1995/96 campaign as did for Ipswich utility man Mick Stockwell's testimonial, which was the reason for Robson's return. Ipswich still have many fans from outside Suffolk who initially latched on to the club in the Robson era and his team were also much-watched on the continent, paving the way for his future managerial roles. Robson's Ipswich team was very popular in Scandinavia, with a certain Swede looking to him for advice as part of his coaching apprenticeship. Former Manchester City boss Eriksson has always been a big fan of the English game and, when a coach in his home country, he visited Ipswich as part of the learning process. When he emulated Robson by being given the role of England manager, Eriksson revealed: "At Ipswich I sat on the bench with Bobby Robson for one game. Not bad, eh!" 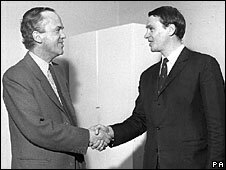 When Eriksson left the England post, the Football Association inquired about Robson becoming interim boss while they searched for a replacement but the plan was vetoed by his then club Newcastle, who eventually axed him. 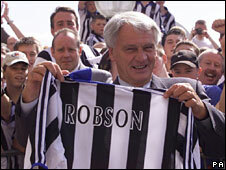 However, despite his exit from the Magpies in 2004 following a poor start to the Premier League campaign, Robson retained a lot of goodwill in Newcastle. He was then aged 71 but insisted: "I'm not thinking about retiring. As long as I can do this job I will do it. I'm as excited and positive as ever and I still have a bright and alert mind." Robson's enthusiasm for the game is legendary and, despite his habit of lengthy team talks and an incorrect use of players' names, he won the respect and admiration of many men in the dressing room as well as the supporters because he was known to put in the work on the training ground. Former England and Ipswich captain Terry Butcher reportedly walked Suffolk neighbour Robson's dog when the ex-Town boss was busy with his duties concerning the national team. Even if the tale turns out to be an urban myth, there is something poignant about the colossus that was Butcher reduced to the role of pet-walker. After all, Butcher was the defender who in the pre-health and safety days of 1989 still fought for every ball in a World Cup qualifier with Sweden, despite being swathed in bandages and drenched in blood from a head wound and yet whom had a such deep affection for the gaffer that he would help out on the domestic front. 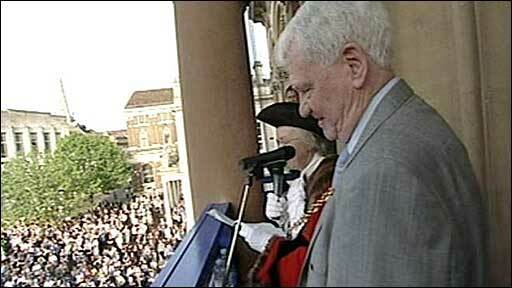 Robson's link with Ipswich came full circle in May 2008 when he was given the freedom of the town to mark the 30th anniversary of the club's FA Cup triumph over Arsenal. Thousands of fans lined the streets to see their former manager and his 1978 squad on an open-top bus parade - and his round of local and national media appearances arguably underlined the affection the average football supporter had for the sort of bloke you would want to debate the state of the game with down at your local pub. Did the FA miss a trick, as with Robson's forerunner Ramsey, by failing to utilise the skills of a man who won at least one trophy in every European nation where he took a managerial role - when a technical post could have offered so much to the English game? And if he had been allowed to continue his work at St James' Park would he have handed the Magpies faithful the modern-day silverware they crave? A few months after his departure from Newcastle he was given the freedom of the city at the civic centre. 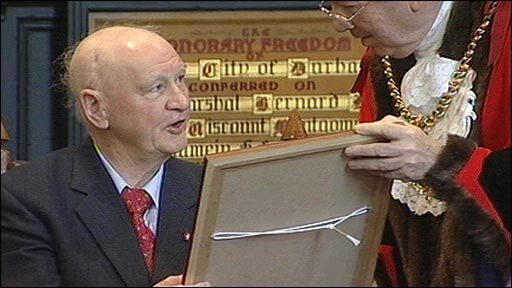 In his 2005 autobiography Farewell but not Goodbye, Robson said of the experience: "A number of councillors wrote to me to say they had never seen so much emotion in a ceremony of that kind. Perhaps it was because I had talked about my father, and how he went down the pit white and came up black, in an area where the two colours symbolise a city's love of football, a love that burns within me and will never fade." It is a fitting way to sum up Robson's obsession with the 'beautiful game'.